History: A single stone was purchased by anonymous dealer from nomads. Physical characteristics: The 22.3 kg stone has isometric shape. A surface is dark brown. Fusion crust is not preserved. Petrography: The meteorite is composed of (vol%) silicate matrix (71.8) and metal (28.2). 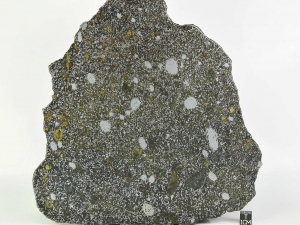 The silicate matrix is medium-grained rock of poikilo-ophitic texture. The rock composes of anhedral and subhedral grains of pyroxene (34.9) surrounded by anhedral and subhedral grains of feldspar (38.5), pyroxene, metal (8.7) and prismatic needles of silica phase (17.9). Larger pyroxene grains poikilitically enclose the grains of all other phases. Minor phases are troilite, schreibersite, chromite, ilmenite and phosphate. 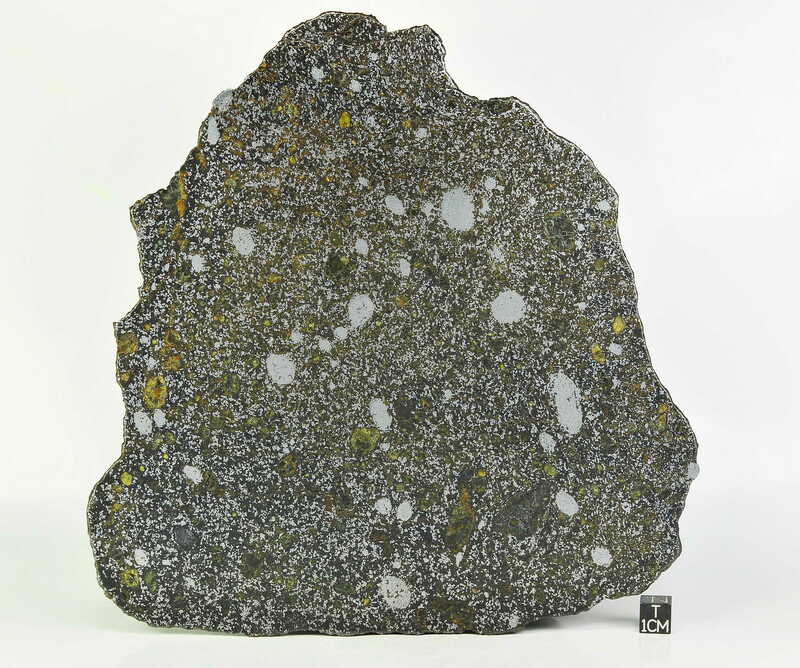 The meteorite contains minor large xenocrysts of pyroxene, xenoliths of pyroxenites, metal nodules and rare metal veins connecting the large metal grains. Geochemistry: Pyroxene: Fs33.9-39.0Wo1.8-3.7 (average Fs37.3Wo2.9; Fe/Mn=24) and Fs15.0-18.1Wo41.1-42.8 (average Fs17.2Wo41.9; Fe/Mn=18.6), feldspar An85.2-90Ab9.8-14.4. Xenocrystic pyroxenes are zoned Fs30.0Wo2.1 (core) – Fs35.7Wo2.7 (rim) (average Fe/Mn=29). Pyroxenite xenoliths: Px is Fs20.8Wo1.2 (Fe/Mn=30), interstitial Px is Fs24.7Wo2.3 (Fe/Mn=30.3), feldspar An84.4-93.5Ab6.3-14.9. Specimens: A type specimen of 118.95 g and five thick polished sections are on deposit at Vernad. Anonymous dealer holds a main mass.